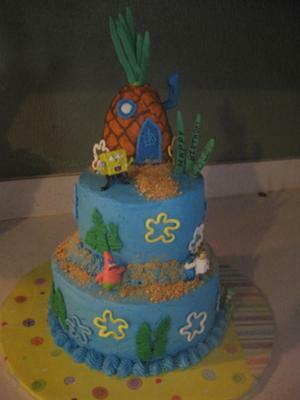 The first step of this Spongebob cake was to make a batch of royal icing tinted different colors and piped the "flowers" and the pineapple top and seaweeds. I used a tip 3 for the flowers and a leaf tip for the pineapple top and other seaweeds. I heated Rice Krispy treat in the microwave and molded it freehand into the pineapple shape. I let this harden for a couple of days. I bake an 8 inch round and a 6 inch round cake with 2 layers each and iced in sky blue and royal blue mixed buttercream then stacked them with straws in the bottom tier for support. I covered the rice krispy treats pineapple with orange/brown buttercream. I used a diamond shaped cutter to mark the pineapple and then piped the brown lines using a tip 2 and brown buttercream. I placed the pineapple on a cake board cut to match the size of the bottom of the pineapple. I stuck a bendable straw into the side of the pineapple and then covered it with blue fondant. I cut out fondant the the shape of the door and window and stuck them in the appropriate place. I placed the pineapple on the cake using straws under for support and hammered a sharpened dowel rod down through the pineapple and both cakes and into the cake board. I added the flowers and seaweed around the cake. I wrote the birthday message on three of the smoothest seaweeds using edible markers from Americolor. I stuck the seaweeds into the top of the cake. To secure the pineapple top I squirted some royal icing into the hole made by the dowel rod and stuck the pineapple top pieces. I piped a border with the same blue buttercream using a star tip. I crushed up graham crackers fine and mixed with some brown sugar. I sprinkled this around the cake for "sand". As the finishing touch I added purchased plastic Spongebob characters. i like to have spongebob birthday cake in my birthday because they are fun . THANK YOU FOR YOUR GENARATION! I really think you should try the premade ones. They do work better and dry harder. It's probably the preservatives that are put in the premade ones that we don't add when we make them. They really work much better. I did followed the recipee on the box, I prepared in a pot on the stove, my structure was so wobbley that I ended up eating it. I did not use on my son's Military Police cake. Actually I was making a building and the walls collapsed as soon as 40 minutes outside the fridge. Should I let them stayed out longer and would work? I buy the premade RKT's and I heat them just a little in the microwave and then mold them. I just let them set out in the open air for a couple of days. i love it!! im going to make one like it for my sons first bday, tobad its not until june, lol. owell im going to save this site and keep it in mind.